Chris Cooke, an international expert on ‘Open Capital’ and a widely published energy market consultant, will discuss his ground-breaking ideas for capital partnerships, a financing structure that could provide a debt-free solution to the Irish property crash. Why is it called Helianthus? While the common name of our plant of the week is Maximilian Sunflower, its botanical name is Helianthus maximiliani (from Greek, Helios: Sun and Anthos: Flower). to yourself and to others and to express yourself honestly in a way that can be heard by others. You will learn through discussion, role-play, reflection, laughter and fun. Work trades and/or energy exchanges possible. Celebrate your community and raise your spirits. Beat the world crisis blues. Taste, smell, hear and see Newbridge in a new light. Sow some seeds for your community in a fun, positive way. Gather ideas, information. Be creative. Jam packed, family-friendly fun! Come to reconnect with a sense of local and ownership of place, to reconnect with a sense of seasonality, to reconnect with cultural traditions, to design and integrate new cultural celebrations and practices. The schedule is found below by clicking Read more. This half-day seminar will share learning from the global mid-term review of the UN Decade for Education for Sustainable Development (ESD) and explore good practice in ESD across the environmental, youth and development education sectors. What is the best way forward for Ireland? And how can we make it happen? This free one-day seminar highlights the importance and relevance of the interconnections between environment, biodiversity and health to our quality of life, sense of place, well-being, economic development and sustainability. It provides examples of these interconnections and outlines the potential benefits of integrating environment, biodiversity and health strategies at local, regional and national levels. It showcases integrated information systems that link health data with environmental data and provides a more comprehensive picture of how the ecosystem approach embraces factors necessary for equitable sustainable development.
. . . that 68% of Irish people cite reasons of personal health as the main reason for their interest in heritage and the environment? ECO-UNESCO, Ireland’s environmental education and youth organisation, is celebrating 10 years of its Young Environmentalist Awards programme with a free exhibition, workshops and training sessions. The organisation is also inviting all young people aged between 12 and 18 years old to celebrate this special date by carrying out an environmental action project with their schools or youth groups. To start the celebrations, a free exhibition celebrating 10 years of ECO UNESCO’s Young Environmentalist Awards is running until 24th September in ENFO, Dublin 2. The exhibition will highlight the achievements of young people who have been working to conserve, protect and enhance Ireland's environment since the awards were launched in September 1999. Everyone welcome, wear outdoor clothing, bring rain gear. Wildlife Photography; the tricks & tips and good wildlife locations in the City. Anthony Woods; Photographer for ‘Wild Dublin’ book as seen on Late Late Show. Central Library, Ilac Centre. Entrance off Henry St.
River Dodder Walk. Dr. Mary Tubridy. Meet at Dropping Well Pub on Milltown Road and walk towards city direction. Tolka Valley Park pond dipping and lake/river exploration. Pádraic Fogarty. Meet on stone bridge linking Ballyboggan Road to Tolka Valley Park. Sustained is holding a one day workshop to examine how we can build on our experiences with collaborative workspaces to find new and more effective ways of working together. This workshop is aimed at sharing skills and capacities to develop ideas and explore the energies around resources in order to collaborate better within the workplace. There is a need for collaboration not just by practice or habit, not just by casual behaviour but with clear and skilled intention. This event is part of the activities around ‘Innovation Dublin 2011. Would you like to build with Cob? This workshop aims to provide the hands on experience needed to design and construct your own structure. 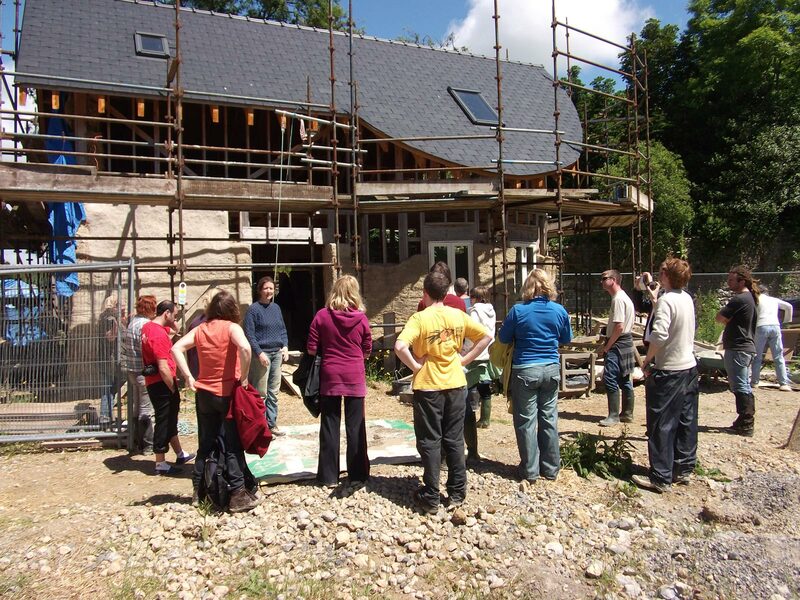 Using traditional Irish building materials and methods of Cob Construction, this workshop in one weekend will teach you all you need to know to build for yourself. No prior construction or D.I.Y. experience is necessary and is suitable for both men and women. Our resilience has been tested over the past few years with economic shocks, energy constraints and unpredictable weather. We are grappling to deal with these shocks. Together we can explore ideas of enabling our communities best deal with these challenges. Facilitated by Davie Philip, Community Resilience Coordinator at Cultivate and a resident of the Cloughjordan Ecovillage. If so, you may qualify for financial assistance from the Local Agenda 21 (LA21) Environmental Partnership Fund 2011. The Fund promotes sustainable development by assisting small scale, non-profit environmental projects at local level. Eligible projects are those that will support and complement, at a local level, national environmental policies such as those on Waste, Biodiversity, Climate Change, Air, Water and Sustainable Development. The International Monetary Fund (IMF) published its most recent World Economic Outlook (WEO) in April 2011. For the first time it included a chapter dedicated to considering the impact of oil supply on the global economy. This significant report is the focus of the seminar. Cultivate's shop is open Sunday 23rd Dec from 12 to 5.30pm and until Saturday from 10am to 5.30pm. The shop will be closed from Monday the 24th until Monday the 7th of January. Featured Product: Reelights - Bike lights with no batteries! When peddling your bike, friction-free Reelight bike lights deliver its own energy source based upon a self-contained electrical system involving high-efficiency LEDs and high-power neodynium magnets. One of our staff, Martin, has a pair and highly recommends them. He says, "They are the best ever!" A public meeting held by the campaign to Save Hume St.
As part of National Volunteering Week and with the help of Waterways Ireland, a canal clean-up event is being organised along the Royal Canal. This project is one of almost 20 similar projects happening across Ireland during National Volunteering Week, under the theme of National Inland Waterways Clean Up. We are currently in the start up phase of refurbishing ten derelict houses in an environmentally sound and sustainable way. It will be part of the Green box project that is being developed by the Organic centre in Rossinver, Co. Leitrim. There aim is to promote Leitrim as an eco tourism destination. Feeding 5K Dublin welcome you to their attempt to feed 5,000 people with food that would otherwise be wasted. The aim of the event is to highlight the amount of food we waste in Ireland and the significant economic, environmental and social consequences associated with it. FB event. Easy to install and require no wiring or running costs. During the day the solar panel converts daylight into electricity and recharges the integrated 'AA' battery. At dusk the light turns on automatically. Some of our staff would like to share some thoughts with you at this holiday season. "It is Christmas time again... a time for shopping? Alongside the material gifts that we share with loved ones, let's share our attention, our love, our caring. While we spend quality time with those near and dear, let's also nuture our sense of belonging to 'All Our Relations'; that is, all people, everywhere, and all other beings as well. While we travel to be with our mother or our father, our children or indeed anyone, let us reflect on how to better care for our shared Mother, Earth, and our shared Father, Sky, and our shared Children, the Future. As we make New Year's resolutions, let's resolve to heal ourselves... and to do so in order that we can be useful to others; in order to cultivate such attitudes as: 'What can I do for you?' and 'How can I be steward of this Earth for the benefit of present and future generations?'" If we are to truly face up to the challenge of climate change, the voices and ideas of those in developing countries need to be heard. ***Speakers from Kenya and El Salvador offer a unique and powerful perspective on this global issue. Climate change is a global justice issue. Carbon emissions from rich countries have contributed most to climate change, yet it is the poor in developing countries who are being hit hardest by its consequences. This spring, Trocaire is offering the public throughout Ireland a chance to hear from two speakers with a powerful insight and expertise on the real impact of Climate Change – coming from two of the countries directly affected. Choose a luxury Cultivate hamper as an exclusive Christmas gift for your loved ones, special clients or valued staff. Select from Cultivate’s range of organic, fair trade and Irish confections to create a truly unique and memorable hamper that is gentle on the environment. Included in the elegant decorated wicker basket is a choice of premium chocolate, cocoa, biscuits, coffee, tea, honey, herbs, oil, book and CD. Contact Alice (01 674 5773 or alice@cultivate.ie) to prepare your sumptuous Cultivate hamper. Price varies depending on your choices. Visit to find a new range of unusual indoor plants including dendrobiums, aloe vera, living stones, prickly pears, bonsai and bonsai starter kits, and large pitcher plants for gobbling up those flies! This season is tree planting season - so make sure you start the new year by planting a jolly green giant - on your patio, in your garden, give it as a gift - or guerilla plant it in your local park! PaperPods - This one is for the kids! These brilliant cardboard toys are made in England from recycled cardboard. Choose from a Teepee, Dolls House, Fort or Play-House. They can be decorated with paint or collage and used inside or out. Guaranteed to provide you and the kids with hours of Summer fun! • how much harmful CO2 you are contributing to the greenhouse effect. Come to Cultivate to enjoy 20% OFF ALL PLANTS in the garden! AND ::: with every purchase you may take home a FREE OAK TREE. We stock rare and unusual plants, edibles, ornamentals, and irish and world trees. Cultivate's Learning and Demonstration Garden is a unique oasis of diversity in the heart of the city. Built at street level the terrace is actually a roof allowing many of the principles of rooftop gardening to be demonstrated in a walk-in facility. The “urban heat island effect” provides a protected microclimate allowing us to experiment with subtropical as well as cool temperate species. The meeting will include a talk, meditation and spiritual singing (Bhajans). Brahmachari Shubamrita Chaitanya has lived with Amma as a monastic disciple since 1989. He is one of Amma’s translators and, as one of Amma’s closest disciples, is invited regularly to hold programmes and courses throughout Europe and India, Australia and Africa. Br. Shubamrita is known for his eloquent spiritual discourses and as a wonderful songwriter and singer of Bhajans (Indian spiritual songs). During his programme in Dublin he will give a talk on how we can apply spiritual principles in our day-to-day life to keep our mind healthy, as well as talking about Amma and her teachings. He will also sing devotional songs and guide a short meditation.